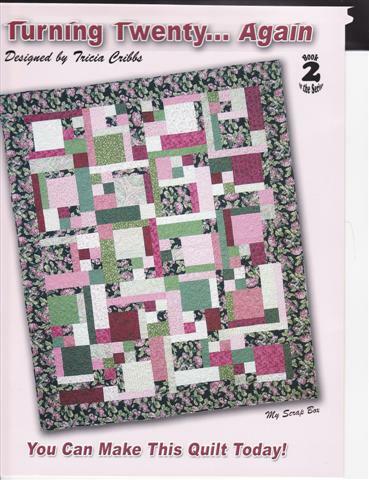 “I don’t know how she does it?.Tricia Cribbs has come up with an “improved” variatin on her best-selling ” Turning Twenty”Pattern that will enthuse quilters again! Meet ” TurningTwenty?Again”. The quilts pictured use the same amount of fabric as her classic “Turning Twenty” (20 fat quarters) but produce more complex and dazzling designs. Turning Twenty Again reintroduces us to thePattern that truly reduced our fabric stashes and helped us make a quilt in record time.